With a 1.9m working platform height, this versatile ‘big brother’ to the Mk I and Mk II, is easy to assemble in just seconds so it is no surprise that the Mark 3 product is growing in popularity. Working at height doesn’t necessarily mean that you need to spend time assembling and dismantling scaffold towers or perching precariously on unstable step ladders. The podium steps Mk III is another option when it comes to safely working on a construction site or even if you are just completing some DIY at home. 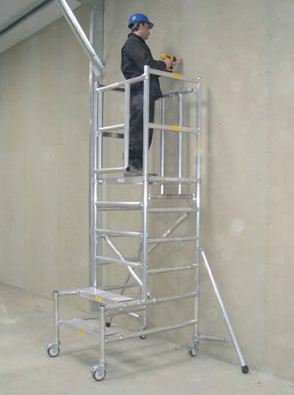 More and more professionals are turning to the podium steps as a viable alternative to mobile scaffold towers and step ladders and it is easy to see why when you examine all the safety features that come with the Mk III. The lightweight Mk III folds flat and it is made from aluminium. Because it weighs only 43kg it means you can easily transport it to and from the site and manoeuvre it into position as you progress the job. And all the equipment meets safety regulations and standards so you can be rest assured that you and your contractors are using the very best kit while you are working on site. Other features include an anti-slip castor and platform deck, a guard rail height of 1m above the platform at all heights and a climbing rung. It also has a deeper back section which makes it even more stable when in use. Contractors also have easy access via the steps which have locking hooks and easy to operate gate locking hook. Outriggers are fitted for extra safety. The Mk III podium steps also come in aluminium or timber steps and platform top finish. The podium steps Mk III is perfect for those smaller jobs at height. It can beassembled in just seconds and it means a single contractor can use it in complete safety alone. Mark 3 podium steps offer a 1.9m platform height. Giving a safe working height of 3.9m.